Qt uses a layout-based approach to widget management. Widgets are arranged in the optimal positions in windows based on simple layout rules, leading to a consistent look and feel. 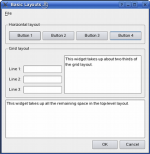 Custom layouts provide more control over the positions and sizes of child widgets. These Qt Examples demonstrate various ways of setting widgets in layouts.